It’s a new year and that means big things at the brewery. Starting in March we will introduce new 16 ounce cans for the first time. Not only that, but we will also introduce two new beers to our annual line-up. Did we mention new beer? Beginning in March we will release two new year round beers. The first, an IPA called Hop Lift. At 6.2% alcohol by volume, Hop Lift is a bold, dry-hopped beer bursting with citrus and passion fruit notes. This will be the first beer to debut under the direction of new Brewhouse Manager Karl Schmitz. Schmitz returned to the brewery in October 2015 after working at a brewery in Iowa for three years. He started his brewing career with the Cold Spring Brewing Company in 2005. The second new beer to the line-up is a Light Lager called Minnesota Gold Light – with a 3.9% alcohol by volume and 157 calories this beer is a lighter version of our popular Minnesota Gold Lager. 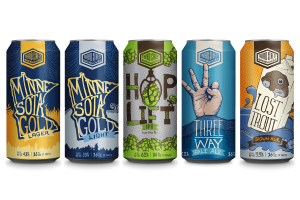 “We feel like Minnesota Gold Light will fill a niche market, especially locally,” said Schmitz. Look for the new 16 ounce cans of Hop Lift IPA, Lost Trout Brown Ale and Three Way Pale Ale in 4 packs at the liquor store. Minnesota Gold Light will join the already available Minnesota Gold Lager in 12 packs.